Authors complain that their publishers and agents won't return their calls. So the recent experience of my friend Tom Page is a delight to behold. UK publisher Trashface was so obsessed with reissuing Tom's fantastique thriller The Hephaestus Plague that they literally tracked him down. Apparently unable to locate him via conventional means, the dauntless publisher ran a genealogy on him, which not only succeeded in finding the target but also links his bloodlines to King Edward III! 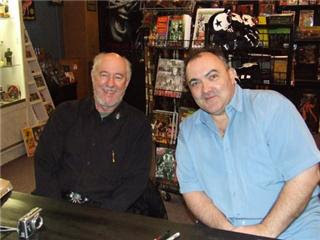 Tom Page (the Bug guy, left) and Peter Atkins (Morningstar, Wishmaster) take a break from defacing brand new books with their scrawls. Gerald Everett Jones is the author of My Inflatable Friend: The Confessions of Rollo Hemphill. 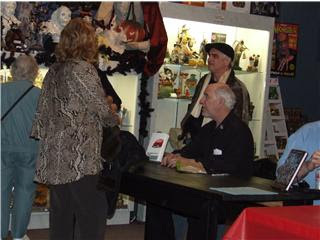 He blogs on comic fiction at Boychik Lit.